The Si version of Honda’s practical compact has always been the coolest, fastest, and most desirable version of the car. It’s got cool aero bits like the sick spoiler and a sharper body kit. It’s got Si badges everywhere. It has a bigger, stronger engine and a bigger exhaust tip. Its wheels are bigger. Its suspension stiffer. Yet, it’s still just a civic. Just a Civic. . .Is that a bad thing? Definitely not, it’s a great thing. I’ll bet just about anyone you ask will respond in a similar manner. The Civic has a reputation for being a good car. They’re generally known for being affordable, practical, efficient, reliable, and inexpensive to own. My first Civic experience was with a 2011 sedan. Although not exciting, it was a great car that is still serving its owner as well as it did on day one. “The Si” as we came to call it, is small but definitely not as small as the Civics of the past. I was surprised to find that it was only three inches shorter than my BMW E36, and a whole two inches wider. The styling of the car is very appropriate. Distinctly Japanese and just the right amount of extra flair to distinguish itself from non Si models. That being said, Something about the proportions of the car seem a little off, but only if you really look at the thing for a while. I think it has something to do with the windshield going all the way to front strut towers. Anyway, it’s a decent looking car. The interior was similar to the last Civic I drove with its split level dash with the addition of a screen on the right of the speedometer. The steering wheel was very much like the newest Accords with easy to use controls. The wheel itself is very comfortable and feels good to hold. The stereo is controlled by a good sized touch screen in the dash between the driver and passenger. As great and modern as it sounds, I still prefer some kind of moving hardware for volume adjustment. The stereo itself sounded great. The big screen was nice for checking my blindspot with Honda’s blindspot monitoring system. It ended up being quite handy. I’m sure we’ll be seeing more tech like this in new cars as we look to the future. The seats are comfortable enough, but definitely not the best I’ve sat in. They lack lumbar adjustment and could use some more bolstering on the sides. But the “Si” badge on the seats is pretty neat. The Si has keyless entry, so upon entering the vehicle, just push in the clutch and press the engine start button. The starter turns quick and the VTEC four greets you with an eager, but drama free hum. Once the engine warms up and settles into its idle, it’s hard to tell if it’s even running. Also, unlike some modern inline fours, there were no vibrations or shaking to be felt (cough cough looking at you Chevy Sonic.) This first impression of smoothness never goes away once you start driving. This car has the smoothest four cylinder engine I’ve yet to experience. The engine is a 2.4 liter DOHC Inline four with i-VTEC. The engine pulls hard and smooth through the first two gears and then settles into a more leisurely but steady march up the the speedometer in the rest of the gears. As the revs build, the engine sounds less like every other car out there and more like a motorcycle. Not that much though because the redline is at 7000 RPM and fuel cutoff at 7200 RPM. So not as high revving as it could be but I have to think Honda made this Si to be just the slightest bit more biased towards practical civilized driving. I would gladly trade off a bit of low end for a another couple hundred RPMs. Regardless of what I’d prefer, the engine is still excellent. Throughout our 600ish miles of driving we averaged anywhere from 29-35 mpg. That includes interstate cruising, mountain hooning, and city waiting. Needless to say, the fun per gallon factor was pretty good. The six speed transmission featured a slick shifter that could be moved with your fingers and snicked in and out of gears with satisfaction. I never missed a gate and found the throws to be the perfect length. The clutch was very light, and the point where it grabbed was a more of a section than a point, allowing super easy starts. I’d highly recommend this car to anyone who wants to learn stick. Seriously, the car makes it so easy. The pedal arrangement really doesn’t allow for normal heel toeing, which is unfortunate because all it really takes is a slightly longer gas pedal. Looking at the 18 inch wheels I initially thought that the ride would be a bit choppy. But alas, even with the the thin rubber the Si soaked up the road with confidence. That’s not to say that we hit a couple bumps that made emit a wincing “Oooh.” Body role was minimal but unusually about on par with the last civic I drove, which isn’t a bad thing as that one cornered quite flat. I just expected this to be even flatter. During our many hours in the car, we were all comfortable and never really bothered with the ride. Driving around in the steep hills and valleys on the way to table Rock State Park proved that the Si was competent in the corners. Although the steering was very responsive, the Si was not as eager to turn in as expected. Making quick, small adjustment with the wheel always resulted in fast immediate movement, but when entering a corner at speed, that immediate feeling went away after turning the wheel a couple of more degrees. However, once in the turn there was plenty of grip, just not as much response from the wheel. Even though my time with the car was brief, it was a good time for sure. 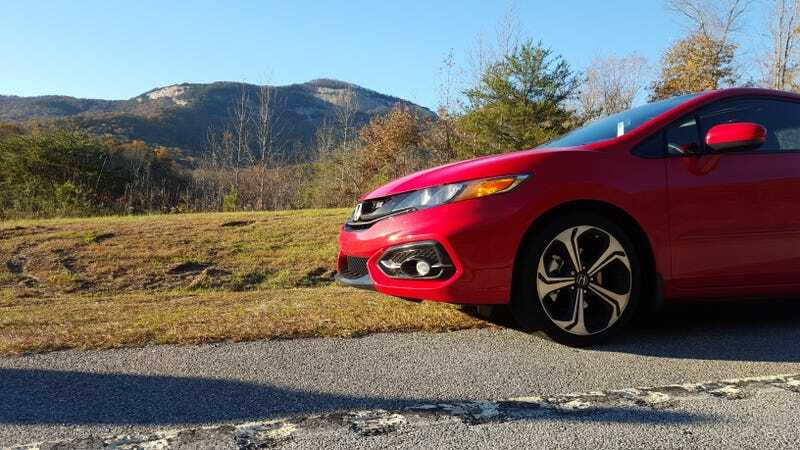 The Civic Si is an excellent car that is super practical even given its small number of doors. Give it a drive when you can. S/O to Mr. Miller for providing the Si.